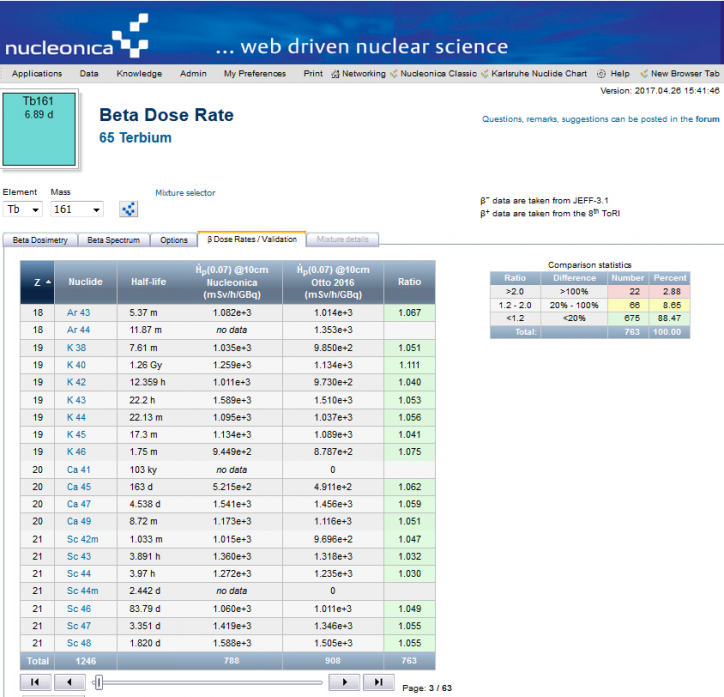 Nucleonica’s Beta Dose Rate application has been extended to include the personal dose equivalent Hp(0.07) @ 10 cm in air for over 760 beta emitting nuclides. The beta spectrum for each endpoint beta energy is used to calculate the flux at a distance of 10 cm from the source. Using the conversion coefficients (from Monte Carlo calculations) for electrons for flux to dose in air, the dose rates at a depth of 0.07 mm are calculated. Of the 763 beta emitters for which data is available, there is good agreement to within 20% for 88% of all nuclides with recent literature values (Otto 2016). 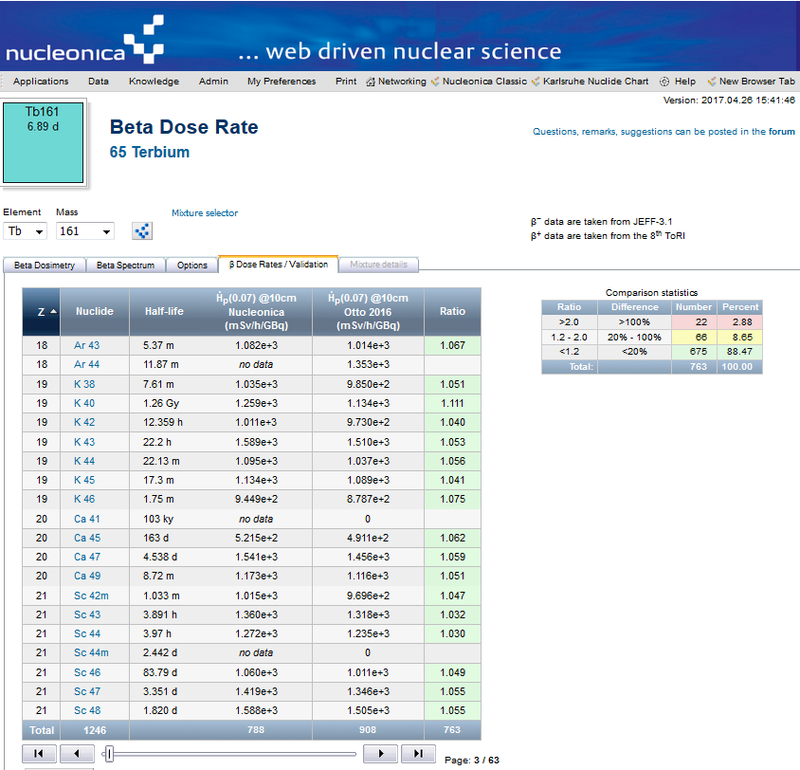 For 66 nuclides (8.6%) agreement is in the range 20 -100% (i.e. a factor two). For 22 nuclides there is quite a large disagreement (> factor 2). A colour coding system has been introduced: green (good agreement within 20%); yellow (agreement to within a factor 2); and red where there are larger discrepancies. In the latter case care must be used with the values given (i.e. need to check the underlying nuclear data). The Beta Dose Rate application has been extended to include the beta energy spectrum using the end-point energies for all beta- and beta+ emitters. Beta spectra can be generated for both individual nuclides and nuclide mixtures. 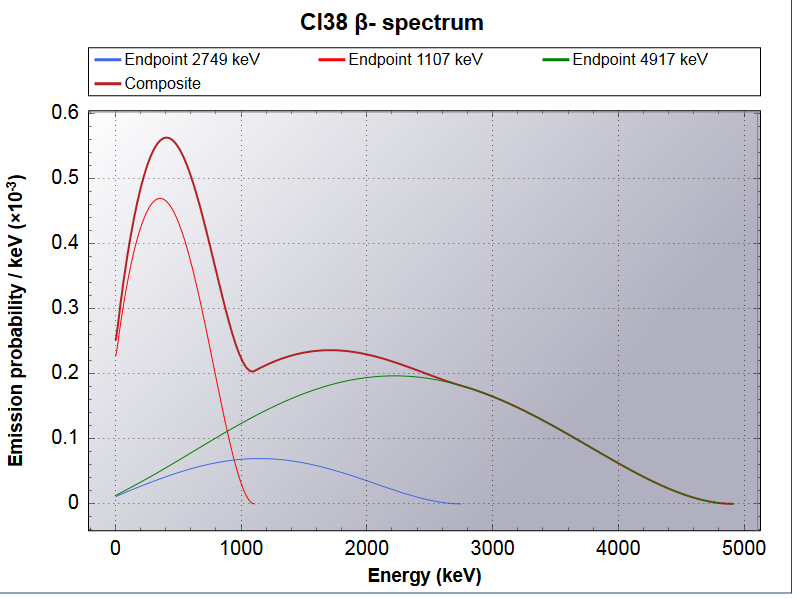 The graph shows the spectrum for each of the three beta end-point energies for Cl-38. In addition, the sum of the spectra is also shown. It is also possible to show the end-point energies, the spectrum, and the end-point energies superimposed on the spectra. The underlying data used in the calculations are currently from the international nuclear datafiles JEFF3.1 for ß- and 8th TORI for ß+. Introduction to Nucleonica: Core Applications and Tools, 5-6 April, CERN, Switzerland, 2017. 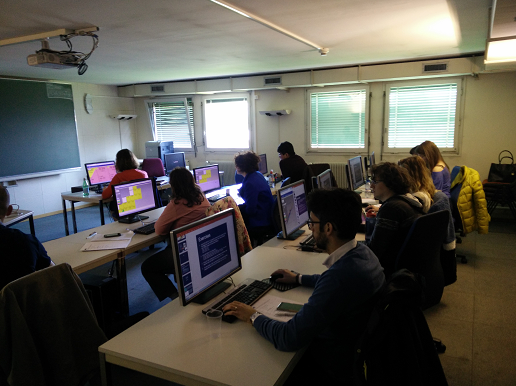 This 2-day training course took place at CERN, Switzerland, during the 5-6 April 2017. This was an introductory level training course which focused mainly on the Nucleonica core applications with emphasis on Case Studies. A detailed description of nuclear data with particular reference to the various Nucleonica nuclear databases was given. Core applications were demonstrated through the use of Nucleonica applications such as the new Radiological Converter, Nuclide Mixtures, Decay Engine++, and Dosimetry and Shielding H*(10). A key lecture was given by Mr. Yann Donjoux (CERN) on the e-Ship++ radiological transport assistant application in Nucleonica. A special session was devoted to gamma spectrometry tools including the Gamma Spectrum Generator, Gamma Library, Cambio and WESPA. The latter tools (Cambio and WESPA) were used for the identification nuclear and radioactive materials. In total, 12 persons took part in the course from CERN. Speakers included Mr. Y. Donjoux (CERN) in addition to Dr. J. Magill and Mr. R. Dreher from the Nucleonica team.